What is the first thing than comes to mind when you think of summer? Sea, palm trees and coconut. No other flavor says “summer” like coconut and no other ingredient gives instant tropical taste to your sweet delights like coconut. The color, the smell, the taste…coconut is the perfect summery ingredient. And the best thing about it is that you don’t have to wait for summer to prepare it. 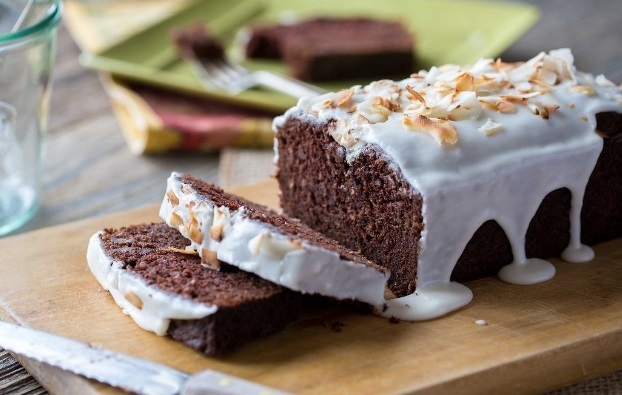 I just love adding coconut into easy, simple treats like banana bread. 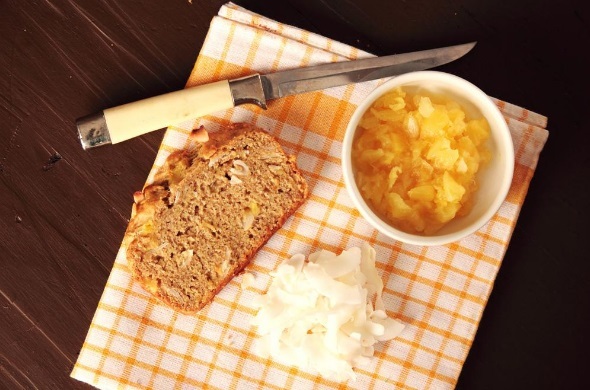 I am never bored with coconut because my cooking app MyGreatRecipes offers plenty of coconut banana bread recipe variations. Replace regular flour with coconut flour. Coconut flour is made completely of pure coconut and is high in fiber, protein, and healthy fats. It is also low in sugar, calories and digestible carbohydrates. This makes coconut flour a favorite amongst vegetarians, paleo and gluten free eaters, including those with Celiac Disease or a gluten sensitivity, those with nut allergies and diabetes. You can mix coconut flour with another type of flour like whole wheat or oatmeal. If you are not using coconut flour I recommend whole wheat instead of regular flour. Just make sure to use organic, virgin coconut oil, not the refined one. 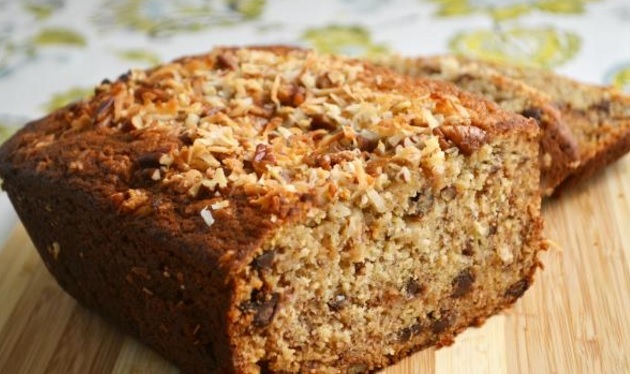 For a true tropical experience, pair coconut with another fruit in the banana bread recipe. 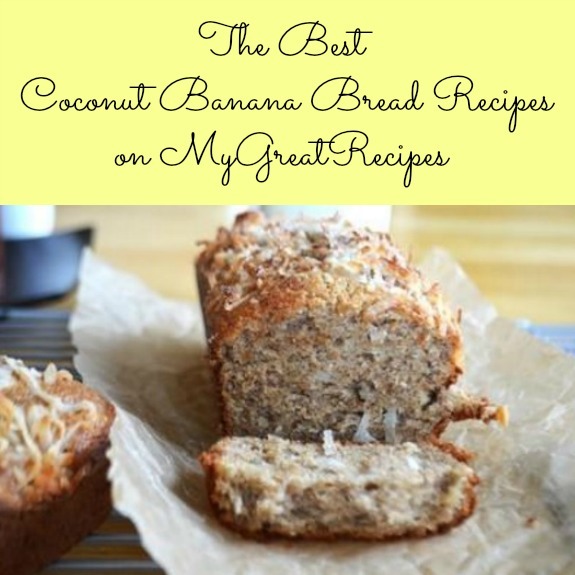 My first recommendation is the Pina colada banana bread, made with pineapple, coconut flakes (one cup of each), rum extract (one tablespoon), pineapple juice (two tablespoons) plus some more toasted coconut on top. Coconut also makes great pair with peaches. This recipe is very convenient if you have tired peaches you need to save besides bananas. One cup diced peaches will suffice. This recipe can handle some booze as well. Try bourbon (max ¼ cup into the batter). The blueberry variation calls for one cup fresh or frozen blueberries, as well as cinnamon, ginger and nutmeg in the batter. This recipe also includes a crunchy streusel topping made with shredded sweetened coconut, blueberries, brown sugar, flour and butter. You can also use a cup of diced strawberries or mix ¾ cup strawberries with ¼ cup raspberries. Add 2 tablespoons chia seeds for extra healthiness. Another great combination is coconut and chocolate (have you ever eaten Bounty chocolate bar? Yeah, that’s what I’m talking about). One cup of chocolate chips will suffice. You can make an easy quick chocolate drizzle by melting some chocolate chips and mixing them with coconut oil. One more suggestion: mix one cup coconut flakes with one cup nuts (pecans) in the banana loaf batter. Cover this bread with a citrus glaze made with lime or lemon juice mixed with powdered sugar and some more coconut flakes. Yum! I love banana bread so I will definitely be trying this recipe, sounds delicious. I’ve never tried coconut in my banana bread before! Sounds delicious! I love coconut so I’ll have to give this a try! I have so many bananas that need to be used up! My daughters love banana bread, and I have never added coconut. It sounds like a wonderful combo. I actually have several bags of shredded coconut (because I got them on sale). This sounds like a great use of coconut. I would love something like this. To me it sounds tropical with the addition of coconut. I will have o try your version!